I meant to blog about this about a week ago, when Will’s Chuck E. Cheese party actually happened, but, well, it’s been kind of a strange week with the strike and everything. So a lot of this is kind of fuzzy memory. “Chuck E. is a mouse,” said Annette. In any event, Will and his friends had a good time, as I think is apparent in this set of photos from the event. Still, I think this is the last time Will will want this sort of birthday party. Most of the other kids who were having parties when he was there for this event were closer to 5 or so. Will’s getting to be a big boy, doncha know. I had fun too, though I have to say that my experience was spoiled/tainted by some of Annette’s past students. I can’t remember how this all came about, but she apparently was talking with some students and asked who it was who got selected to be in the actual Chuck E. Cheese suit. Without missing a beat, these students said “the newbie.” And, apparently, the actual Chuck E. Cheese suit, which is unbearably hot and uncomfortable, smells like the sweat of all of those who have worn the suit previously. 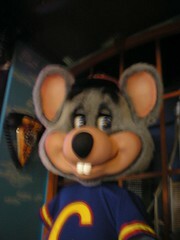 That thought makes this little silent video of Chuck E. dancing all the more creepy. Anyway, happy birthday (belated) Will, and please don’t make me go back here.